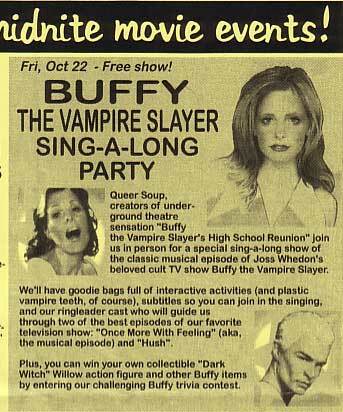 Buffy Musical Midnight Movie Spectacular! 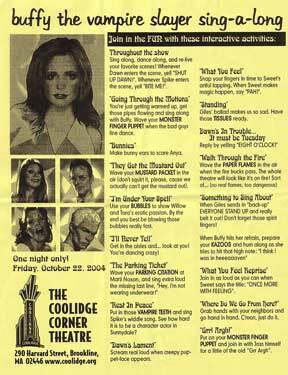 On October 22, 2004, The Coolidge Corner Theature in Brookline, MA presented a free midnight showing of the Buffy musical episode, "Once More With Feeling" followed by "Hush". Acompanied by my vampire companion and 4 other fans, got there 45 minutes before it started and while the line was long already as we suspected it would be, by the time we went in the line was down the back parking lot and around the corner! About 6 people dressed and behaving as Zombies (drunk zombies!) appeared and shamlessly cut in line. But we didnt mind because the entertainment they provided was worth the price. Inside you could get a goodie bag for $6 containing objects used in the Singalong. Once we got in the MC came out and talked about the show and then a group called Queer Soup did a musical number based on Buffy, Angel, and Spike. They came out after at intermission for another one. Initially we had thought this would be more of a Rocky Horror type thing where this group would act out the scenes and sing on stage while the episode played but that was not the case. But it didn't matter because people were more than happy to sing and dance along. I can't help but wonder if Joss had imagined a time when the DVD came out that this episode would be shown in a group or at a con or movie theater as a sing along. After all, during "Something to Sing About" there is a close up of Buffy urging you to sing along. The singalong image below links to a larger image and there is also a page with the text version. I don't know if the MC at the Coolidge made them up or found it on the internet but they're cool. keywordskeywords for google ads which dont seem to get the correct context on image heavy pages. . .